Mortgage interest rates in Australia have increased in recent months, despite a steady cash rate. Domestic mortgage rates are heavily influenced by a combination of factors in addition to the official cash rate, and two we’re going to focus on in this paper are the banks’ exposure to domestic and offshore debt capital markets, as well as interest rates paid on deposits. In essence, banks endeavour to make a net interest margin by charging borrowers a higher rate of interest than they pay on deposits and wholesale funds. If funding costs increase, the banks will typically look to pass through these costs to borrowers in the form of higher borrowing interest rates, in an attempt to maintain a stable net interest margin. 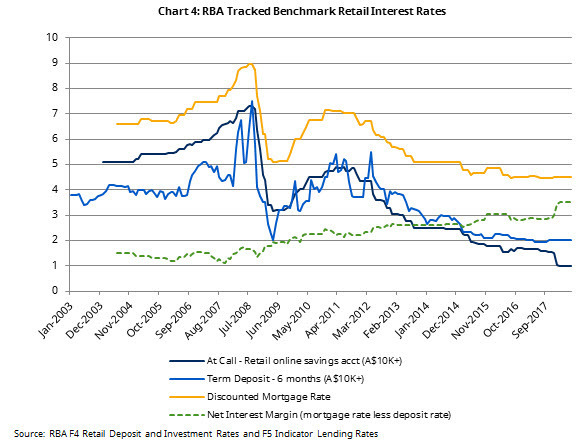 Why have some lenders increased mortgage rates recently when the RBA is on hold? The RBA has not changed the target cash rate since August 2016, yet we have seen numerous regional and third tier banks increase their mortgage rates recently. Almost all of these banks have cited the increase to their wholesale funding costs from the recent increase in the swap rate (3M BBSW), and their need to pass on these costs to borrowers so their margins can be maintained. The bank bill swap rate is the primary short-term reference lending base rate used in debt capital markets. The margin above the cash rate is driven by the banks charging a fee above the risk free rate, and the interplay between demand and supply. The banks’ wholesale funding is almost always converted into a set margin above this swap rate, so movements in the swap rate impact the vast majority of wholesale funding costs. 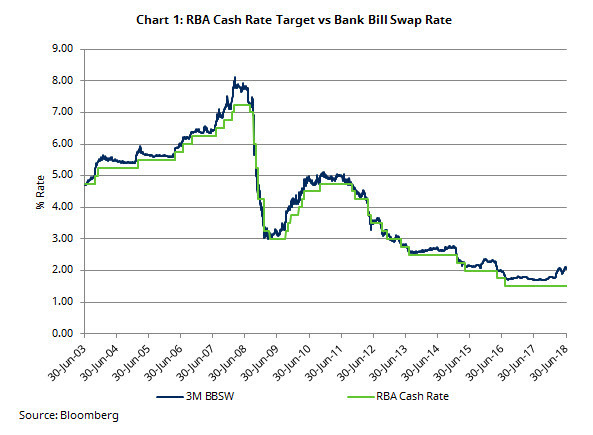 The swap rate has been, on average, 20bps wider than the RBA cash rate since 2003; however, it has recently spiked and currently sits 56bps wider than usual levels, effectively adding 36bps in additional wholesale funding costs. Many factors are influencing the widening in the swap rate, an occurrence that is at odds with most offshore swap markets suggesting uniquely Australian issues are at play. One driver has been the decline in deposit growth, forcing the banks to obtain higher levels of funding from domestic and offshore debt capital markets, along with the impact of quantitative tightening in the US and evidence that the RBA is less active in providing liquidity support through its open market operations. Suncorp was the first bank to raise mortgage rates in late March, citing the impact of rising swap spreads. 17% of Suncorp’s funding comes from debt capital markets, predominantly priced off the Australian swap rate, and so the additional 36bps increase in the swap rate has effectively added approximately 6bps to total funding costs. Suncorp raised mortgage rates by 5-12bps for owner occupiers, and 8-12bps for investor loans. Banks that have a higher level of deposit funding will be comparatively less affected with the increase in the swap rate. Will rising rates in the US drive up mortgage rates in Australia? In the Australian economy, total bank loans exceed total deposits, resulting in the banks’ reliance on both domestic and offshore debt capital markets to fund the shortfall. When the balance sheets of the four major banks are consolidated together, 80.5% of total funding is sourced from deposits and the remaining 19.5% is sourced from debt capital markets (see Chart 2). US dollar funding is the largest source of wholesale funding, making up 8.8% of total funding. 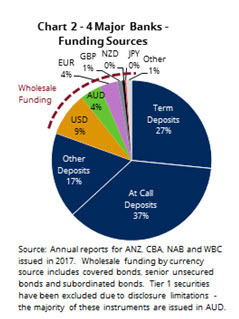 When wholesale funding is issued, the banks will usually, at the same time, enter into derivative contracts to swap both the currency and interest rate exposure back to AUD and a margin over the Australian swap rate (usually 3M BBSW outlined above). This means the banks carry no ongoing exposure to both interest rates in the country of issuance, and corresponding exchange rates for offshore debt issuance. The US cash rate (Fed funds rate) moves independently of the RBA cash rate (see Chart 3), reflecting differing economic growth and inflation expectations in each country. The Australian economy is now more closely linked to China than the US. 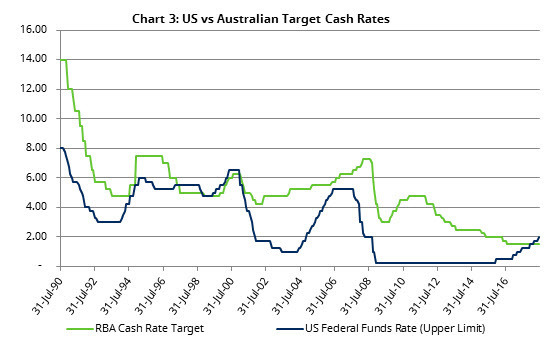 As a result, rising cash rates in the US are unlikely to have a direct impact on Australian cash rates and Australian mortgage rates. How are deposit rates impacting mortgage rates? The recent changes in mortgage interest rates have been relatively small when compared to the fall in deposit rates, in particular rates paid on ‘at-call’ bank accounts, including online saver and cash management type accounts. Chart 4 highlights the 50bps fall in online saving account interest rates in January 2018, a significant fall in relative terms but significant given at-call accounts are the largest category of bank funding – 37% of total funding. At-call savings accounts are now valued less by the banks given new liquidity regulations. Deposit holders have suffered a considerable decline in interest rates, supporting the spread between deposits and mortgage rates. In essence, the fall in deposit rates has limited further upward moves in mortgage interest rates, partially absorbing higher funding costs and the additional costs of tighter capital and liquidity requirements on banks. Mortgage holders have benefited to the detriment of deposit holders. What is the most likely driver of mortgage rates in Australia going forward? An increase in the cash rate would have a significant and direct impact on mortgage rates. However, we anticipate that there will be no change to the cash rate, potentially for another 12 months or longer. An increase in the cash rate would impact deposit rates and the swap rate, impacting almost all sources of funding. The swap rate could continue to increase, as historically, the swap curve has been a further 20bps wider; however, this only impacts the wholesale funding component of total funding costs. Higher offshore funding costs will adversely impact funding costs but only for incremental debt issuances and such increases take time to cycle through the entire wholesale funding profiles. Higher deposit rates are probably the most likely to surprise the market, particularly if the current slowdown in deposit growth continues. Given deposit funding is such a large component of total funding, any increase in cost will have a proportionally larger increase in overall funding costs and place upward pressure on mortgage rates. The bottom line is that, absent a rise in the official cash rate in Australia, any increase in Australian mortgage interest rates are likely to be modest. Has any lender ever decreased their mortgage rates for existing mortgage holders when their cost of funding has decreased? It seems they will pass on higher costs of funding by raising the interest rate but just wondering if it is a two way street and they have ever cut rates out of cycle? None of my lenders have in the past 20 years and surely there were times when overseas interest rates dropped. Adam, you may or may not recall that mortgage interest rates in the 90's were around the 15% mark. Clearly the banks have passed on some of their reduced funding costs since that time.